Are you ready for the 31st Annual Emerald Nuts Midnight Run? 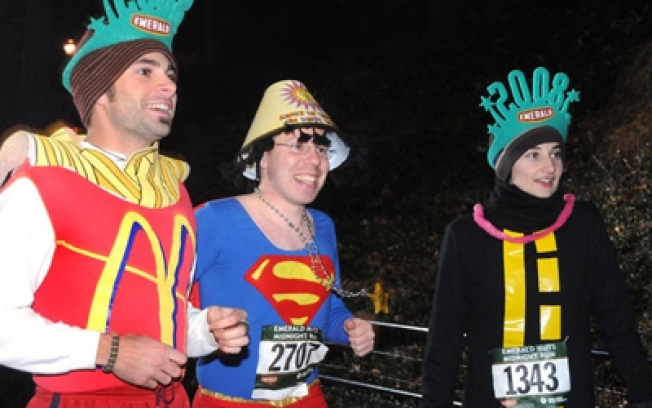 Run for fun (and in costume) with the Emerald Nuts on New Year's Eve. And while you couldn't pay us enough to run at midday on March 12th, much less get kitted out to run four miles in the freezing cold as the city counts down to midnight on the 31st, we love every one of you, participants in the 31st Annual Emerald Nuts Midnight Run. We love that you all try to outdo each other with "nuttiest" costumes. We love that you pay actual money ($30-$50) to exercise in a public place. But we say, why stop there? If you're going to get all extreme-sportsy to welcome in 2009, the Coney Island Polar Bear Club New Year's Day swim should bookend your night. (Registration at www.nyrr.org required; Central Park Bandshell 10PM).